Not something you want to see outside your condo. 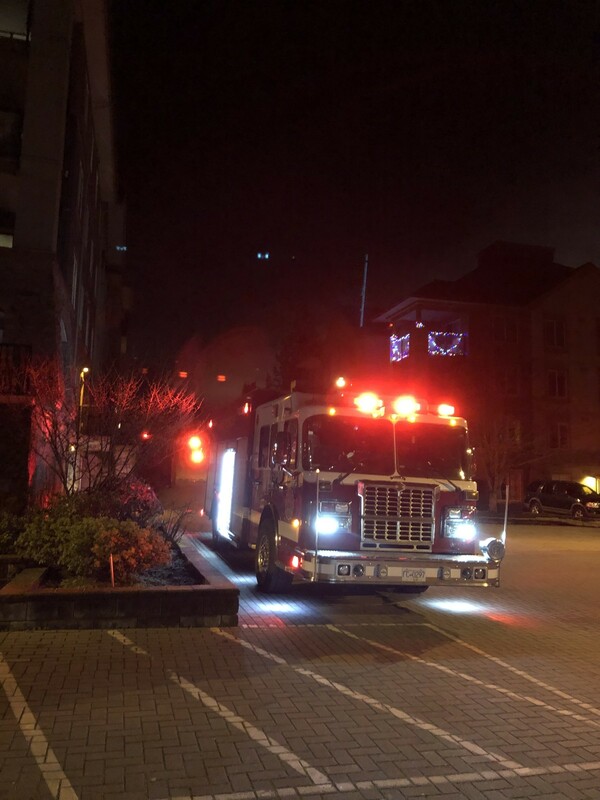 It was Saturday night and I was getting ready for bed at the fashionably late hour of 12:45 a.m. when the fire alarm went off in my building. The condo has two alarms, one in each bedroom, and if you think of a 747 on takeoff as producing a sound level of 10, these alarms produce a sound level of 10 million. The only way you would not hear them is if you were deaf and even then you’d probably still feel the sound waves blasting against your body. I put on my shoes, jacket and cap, grabbed my phone and headed out into the chilly 3ºC weather to gather with the neighbors I never see. I noticed what looked like smoke coming from the back of the building, so walked around the side and discovered it was just a steam plume from the hospital. A few minutes later the first fire truck arrived and the firefighters gathered at the panel in the lobby that was flashing angrily. About ten minutes after that the panel was silenced and we were waved to head back in. I overheard some speculation that “dust” or something may have set off the alarm, which I kind of hope is not what happened, because dust is not exactly a rare thing. But it was confirmed that the alarm was not deliberately set off, as they didn’t have to reset it. With nothing on fire, I was safely tucked into bed shortly after 1 a.m. I was a bit concerned the alarm might go off again (because, you know…dust), but fortunately it didn’t. Today I am happy there was no fire and my ear drums are not burst. Seriously, that alarm is loud enough to break bone.